Here is the largest planet in the Solar System, with more mass than all of the other planets and moons combined. In fact, if Jupiter had more mass, it would ignite hydrogen into helium and be a star. The most distinctive feature of this planet, other than its large size, are the distinct color bands and Great Red Spot. While the other gas giants have banded weather, none is quite as distinct or as colorful as Jupiter. The colors are due to trace chemicals at different cloud depths. The Red Spot is an enormous hurricane-like storm that has run unabated for over 400 years, ever since it was first noticed. Second, Jupiter is the first of four giant planets, and it is composed primarily of gas. If you watched the Star Wars movie, "Empire Strikes Back," you will recall the scene on the gas planet where Lando was mining. This memorable scene is not feasible on Jupiter, but serves to make a connection for you. The reason such a manned station is not presently possible is that we do not have the technology to deal with the lethal radiation trapped within the magnetic field of Jupiter. This feature makes Jupiter impossible for humans to get within a 3 million km distance of the planet without suffering immediately lethal radiation poisoning. Jupiter has a ring system, similar to Saturn, but far less grand and invisible from Earth's telescopic view. Perhaps the most exciting aspect of Jupiter may be its Galilean moons, Io, Europa, Ganymede, and Callisto. Each of these 4 large moons has a fascinating geology, with Io being the most volcanic body in the Solar System, and Europa having a liquid ocean beneath its crust of ice. With so many moons, such large size, and complicated weather, Jupiter requires the most time for study, with the possible exception of Mars. We have learned much about this mini-solar system from Pioneer 10 and 11, Voyager 1 and 2, Ulysses, Galileo, and Cassini spacecraft. 79 as of July 17, 2018 when 12 new discoveries were announced. Metis, Adrastea, Amalthea, Thebe, Io, Europa, Ganymede, Callisto, Themisto, Leda, Himalia, Lysithea, Elara, Carpa, Euporie, Orthosie, Euanthe, Thyome, Mneme, Harpalyke, Hermipae, Praxidike, Thelxinae, Iocaste, Ananke, Arche, Pasithae, Chaldene, Kale, Isonoe, Aitne, Erinome, Taygete, Carme, Kaylke, Eukelade, Kallichore, Helike, Eurydome, Autonoe, Sponde, Pasiphea, Megaclite, Sinope, Hegemone, Aoede, Callirrhoe, Cyllene, plus 31 more new moons without names. Jupiter is the fourth brightest object in the sky (after the Sun, the Moon and Venus; at some times Mars is also brighter), and therefore it has been known since prehistoric times. Galileo's discovery, in 1610, of Jupiter's four large moons Io, Europa, Ganymede and Callisto (now known as the Galilean moons) was the first discovery of a center of motion not apparently centered on the Earth. It was a major point in favor of Copernicus's heliocentric theory of the motions of the planets. Galileo's outspoken support of the Copernican theory got him in trouble with the Inquisition, but it was this observational evidence as well as his discovery that the phases of Venus changed in size that really put an end to geocentrism. Jupiter was first visited by Pioneer 10 in 1973 and later by Pioneer 11, Voyager 1, Voyager 2 and Ulysses. The spacecraft Galileo orbited around Jupiter and its large moons for 8 years before JPL engineers sent it plunging into the atmosphere of Jupiter. During the summer of 2002 Cassini flew by Jupiter en route to Saturn and returned some very nice images. The picture below is my favorite from Cassini. Click on this image for information about this specific image. The gas planets do not have solid surfaces, their gaseous material simply gets denser with depth (the radii and diameters quoted for the planets are for levels corresponding to a pressure of 1 atmosphere). What we see when looking at these planets is the tops of clouds high in their atmospheres (slightly above the 1 atmosphere level). Of interest here is that you would not find sudden transitions from a solid core to a liquid mantle to a gaseous atmosphere. The phase changes between layers is very subtle and spread over great depths such that if it were possible to probe deep into the interior of Jupiter, you would not notice when you changed layers. Jupiter is about 90% hydrogen and 10% helium (by numbers of atoms, 75/25% by mass) with traces of methane, water, ammonia and "rock". This is very close to the composition of the primordial Solar Nebula from which the entire solar system was formed, and close to the levels of gas content in our Sun. Saturn has a similar composition, but Uranus and Neptune have much less hydrogen and helium. Our knowledge of the interior of Jupiter (and the other gas planets) is highly indirect and likely to remain so for some time. (The data from Galileo's atmospheric probe goes down only about 150 km below the cloud tops.) If you have forgotten by now, on December 7, 1995, the Galileo spacecraft dropped a probe into the Jovian atmosphere to try to learn what was under the visible uppermost cloud layers. The probe lived for less than one hour, plummeting to a depth of roughly 150 km before we lost its transmission. Shortly thereafter, the spaceprobe encountered increasing atmospheric pressures and heat such that the probe itself was atomized. While it penetrated only a short distance, we did learn a few things from this mission. Detailed probe data is available within this course. Three distinct layers of clouds are believed to exist consisting of ammonia ice, ammonium hydrosulfide and a mixture of ice and water. However, the preliminary results from the Galileo probe show only faint indications of clouds (one instrument seems to have detected the topmost layer while another may have seen the second). But the probe's entry point was unusual -- Earth-based telescopic observations and more recent observations by the Galileo orbiter suggest that the probe entry site may well have been one of the warmest and least cloudy areas on Jupiter at that time. One thing we do know ... Jupiter's outer atmosphere is cold, at 165K, and dominated by Hydrogen and Helium gases. The farther one descends into those clouds, the hotter one would become and the more intense the pressure one would feel. Jupiter and the other gas planets have high velocity winds which are confined in wide bands of latitude. The winds blow in opposite directions in adjacent bands. Slight chemical and temperature differences between these bands are responsible for the colored bands that dominate the planet's appearance. The light colored bands are called zones; the dark ones belts. The bands have been known for some time on Jupiter, but the complex vortices in the boundary regions between the bands were first seen by Voyager. The data from the Galileo probe indicate that the winds are even faster than expected (more than 400 mph) and extend down into the atmosphere at least as far as the probe was able to observe; they may extend down thousands of kilometers into the interior. Jupiter's atmosphere was also found to be quite turbulent. This indicates that Jupiter's winds are driven in large part by its internal heat rather than from solar input as on Earth. Click on this link to see an amazing photograph of the clouds of Jupiter as taken by the Juno spacecraft on December 16, 2017. The vivid colors seen in Jupiter's clouds are probably the result of subtle chemical reactions of the trace elements in Jupiter's atmosphere, perhaps involving sulfur whose compounds take on a wide variety of colors, but the details are unknown. The colors correlate with the cloud's altitude: blue lowest, followed by browns and whites, with reds highest. Sometimes we see the lower layers through holes in the upper ones. The cloud is not as famous as Jupiter's Great Red Spot, known here instead as Jupiter's Brown Spot (oh how creative the science team is in generating appropriate names for objects they find). I am here reminded of a quaint little question, "What's brown and sits on the piano bench? Why Beethoven's Last Movement." Ha ha ha! This image of the south pole of Jupiter was put together by the Juno spacecraft mission team. Click on the space.com link to learn more. Jupiter radiates more energy into space than it receives from the Sun. The interior of Jupiter is hot: the core is probably about 20,000 K. The heat is generated by the Kelvin-Helmholtz mechanism, the slow gravitational compression of the planet. (Jupiter does NOT produce energy by nuclear fusion as in the Sun; it is much too small and hence its interior is too cool to ignite nuclear reactions.) This interior heat probably causes convection deep within Jupiter's liquid layers and is probably responsible for the complex motions we see in the cloud tops. Saturn and Neptune are similar to Jupiter in this respect, but oddly, the planet Uranus is not. As I mentioned at the top of the page, Jupiter is similar to the Sun in almost every aspect except in mass. The theoretical lower limit if mass required to ignite thermonuclear fusion is .08 Suns. Jupiter is not at this level, but if Jupiter had 80 times more material, its core pressures would be sufficient to generate the requisite heat for fusion ignition and then Jupiter would be a star. Indeed, in the movie, "2010, a Space Odessy" Jupiter ignites into a star. But this scenario, although based on some fact, is not possible due to the lack of mass ... a lot of mass in fact. Jupiter is just about as large in diameter as a gas planet can be. If more material were to be added, it would be compressed by gravity such that the overall radius would increase only slightly. A star can be larger only because of its internal (nuclear) heat source. The process of thermonuclear fusion exerts tremendous outward pressure that counteracts gravity's inward pressure. This is why stars are so large. Jupiter has a huge magnetic field, much stronger than Earth's. Its magnetosphere extends more than 650 million km (past the orbit of Saturn!). (Note that Jupiter's magnetosphere is far from spherical -- it extends "only" a few million kilometers in the direction toward the Sun.) Jupiter's moons therefore lie within its magnetosphere, a fact which may partially explain some of the activity on Io. Unfortunately for future space travelers and of real concern to the designers of the Voyager and Galileo spacecraft, the environment near Jupiter contains high levels of energetic particles trapped by Jupiter's magnetic field. This "radiation" is similar to, but much more intense than, that found within Earth's Van Allen belts. It would be immediately fatal to an unprotected human being. The Galileo atmospheric probe discovered a new intense radiation belt between Jupiter's ring and the uppermost atmospheric layers. This new belt is approximately 10 times as strong as Earth's Van Allen radiation belts. Surprisingly, this new belt was also found to contain high energy helium ions of unknown origin. In the "Voyager" video we show at school, Ed Stone discusses how Jupiter's magnetic field can be so immense. Io is erupting 2 tons of material per second into space, and this material is trapped within Jupiter's magnetic field and Io's orbit, forming a donut-shaped torus. This torus is thought to be responsible for inflating the magnetic field of Jupiter some three times what it might otherwise be. Jupiter is shown with several important components of its magnetosphere in this artist's representation based upon the Juno spacecraft that is presently studying the planet, as of July, 2018. The planet's magnetic field is represented by soft purple lines that connect its north and south magnetic poles. Jupiter's brilliant auroras glow at the poles, while the bright areas to the left and right of the planet's equator represent the regions of most intense charged particle radiation - Jupiter's inner radiation belts. The Juno spacecraft will, broadly speaking, pass between the planet and the most intense areas of radiation. On September 5, 2018 ... Nature Magazine (arguably the definitive journal of science on the entire planet) announced a startling discovery made by the Juno space satellite. We spend a fair amount of time as teachers trying to help students improve their vocabulary and reading skills. We talk about Tier 1 words as being around 6th grade level, but more likely what you do with Twitter and Facebook. Tier 3 words are high level for high school. When you read original research in a refereed journal like Nature or Science magazines, the vocabulary is like Tier 5. The abstract of the Nature Magazine article about the extreme odd nature of Jupiter's magnetic field can be linked to HERE. It is challenging to read, but the folks at Spaceweather.com did a very nice job of summarizing the discovery on their September 7, 2018 edition. It is seen below. JUPITER HAS AN EXTRA MAGNETIC POLE: When NASA's Juno spacecraft reached Jupiter in 2016, planetary scientists were eager to learn more about the giant planet's magnetic field. Juno would fly over both of Jupiter's poles, skimming just 4000 km above the cloudtops for measurements at point-blank range. Today in the journal Nature, a team of researchers led by Kimberly Moore of Harvard University announced new results from Juno--and they are weird. Among the findings: Jupiter has an extra magnetic pole. "We find that Jupiter's magnetic field is different from all other known planetary magnetic fields," the researchers wrote in the introduction to their paper. The best way to appreciate the strangeness of Jupiter's magnetic field is by comparison to Earth. Our planet has two well-defined magnetic poles--one in each hemisphere. This is normal. Jupiter's southern hemisphere looks normal, too. It has a single magnetic pole located near the planet's spin axis. Jupiter's northern hemisphere, however, is something else. The north magnetic pole is smeared into a swirl, which some writers have likened to a "ponytail." And there is a second south pole located near the equator. 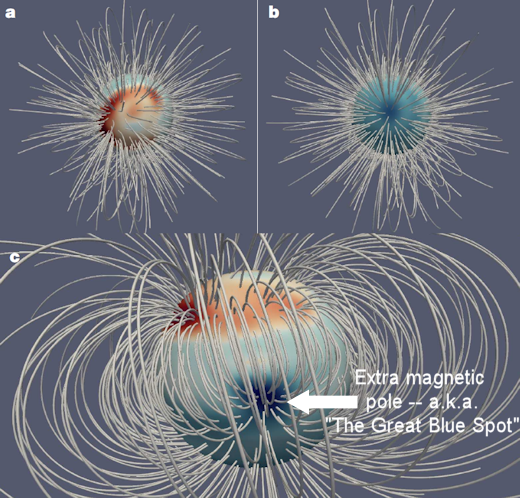 The researchers have dubbed this extra pole "The Great Blue Spot" because it appears blue in their false-color images of magnetic polarity.. In their Nature article, the scientists consider the possibility that we are catching Jupiter in the middle of a magnetic reversal--an unsettled situation with temporary poles popping up in strange places. However, they favor the idea that Jupiter's inner magnetic dynamo is simply unlike that of other planets. Deep within Jupiter, they posit, liquid metallic hydrogen mixes with partially dissolved rock and ice to create strange electrical currents, giving rise to an equally strange magnetic field. More clues could be in the offing as Juno continues to orbit Jupiter until 2021. Changes to Jupiter's magnetic structure, for instance, might reveal that a reversal is underway or, conversely, that the extra pole is stable. Stay tuned for updates. Unlike Saturn's, Jupiter's rings are dark (albedo about .05). They're probably composed of very small grains of rocky material, and unlike Saturn's rings, they seem to contain no ice. In July 1994, Comet Shoemaker-Levy 9 collided with Jupiter with spectacular results (left). The effects were clearly visible even with amateur telescopes. The debris from the collision was visible for nearly a year afterward with Hubble Space Telescope. Jupiter has 79 known satellites: the four large Galilean moons, 12 smaller named ones that have been known since at least 1980, plus 47more small ones that have recently been discovered since the Voyager flybys, as well as 12 that were just discovered on July 17, 2018. To learn more about these new moons, go to Scott Sheppard's web site, or the University of Hawaii's Irregular Satellite page. Io, Europa and Ganymede are locked together in a 1:2:4 orbital resonance and their orbits evolve together. Callisto is almost part of this rotation/revolution relationship as well. In a few hundred million years, Callisto will be locked in too, orbiting at exactly twice the period of Ganymede (eight times the period of Io). Many more small moons have been discovered recently but have not as yet been officially named. Moons of Jupiter discovered since Voyager 1 and 2 and recently named by the IAU. *Values for the smaller moons are approximate* (distance is from Jupiter's center to the mean orbital distance). There are 2 as yet unnamed moons discovered in 2000 and 2002, along with a new listing of 21 more moons discovered in 2003 ... and it seems that the list will continue to grow! Since the Voyager mission in 1979, 45 more moons of Jupiter have been discovered through various means. To learn more about these discoveries, check out the websites below. Some of them are receiving their new names. Mildly interesting from this chart is that Nicholson discovered 4 moons, but over a 37 year period. This man must have enjoyed looking through his telescope and making detailed drawings of star positions to notice something so small and insignificant as the smaller moons of Jupiter are. Io is the innermost of the Galilean moons and the moon that altered the expectations of the Voyager ground team. The Voyager science members expected the moons of the solar system to be quite bland and geologically lifeless. The discovery of active volcanism on Io was totally unexpected. As Larry Soderblom explains in the "Voyager" video, "the closer and closer we got to Io, the more the surface showed nothing at all like craters." In fact, Io is such an active volcanic object, its entire surface gets a new coat of material every 100,000 years. To learn more about this fascinating moon, click on the image of Io to your left. THUS, VOYAGER MISSION SCIENTISTS HAVE SAID THAT THE DISCOVERY OF ACTIVE VOLCANOS ON IO WAS THE GREATEST SURPRISE OF THE MISSION. Europa is the second Galilean moon out from Jupiter, and this object is almost as smooth as a cue ball, or perhaps even my own head! Scientists have found the surface to be covered with a 100 km thick layer of water ice. The gargantuan faults are areas where the surface ice has cracked and liquid from the interior has welled up and flooded out. Indeed, a close look at the surface is very much like looking at polar ice on the Earth. To learn more about Europa, click on the image to your left. Ganymede is the third Galilean moon away from Jupiter's clouds, and is the largest moon in the solar system. Its geology is more complicated than Io or Europa, but far less active, if at all anymore. Scientists were stunned to find that Ganymede has a magnetic field, so its interior must still be molten. It seems to be covered by ices and dirt. To learn more abouy Ganymede, click on the image to your left. Callisto is the outermost of the Galilean moons, and perhaps owns the title of "oldest surface" in the solar system. This moon is literally saturated with craters. It is just a little smaller than Ganymede, and also boasts a magnetic field. To learn more about Callisto, click on the image to your left. Below is a comparison of the four Galilean moons, looking at the full global image, major geologic features, and a close-up of each moon's terrain. This image below is a comparison of the interiors of the four Galilean moons as believed to be on the basis of data collected by the Galileo spacecraft. As mentioned above, Jupiter has faint rings composed of rocky material probably ejected from the meteoric impacts on the inner moons of the planet. To learn more about these rings, click on the image to your left. Distance is from the center of Jupiter to the inner edge of the ring. Jupiter is the JPL website that can offer more information to you, as well as some interesting connecting links. Whoa! What's this? I put this here in case you did not notice it earlier. In the summer of 1994, Jupiter was hit by a series of comet fragments in spectular fashion. The comet named Shoemaker-Levy 9 after the codiscoverers, put on a display that even I was able to see from my backyard in Minneapolis. Check out the SL9 web site to learn more about this event, and then start thinking ,"What if the Earth were hit by a comet?" So much of what we have learned about Jupiter comes from the highly successful satellite, Galileo. On September 17, 2003, the satellite was turned off after completing the objectives of its mission. Overall, the satellite served the NASA and JPL engineers for 14 years. To read a press release of the final days of the satellite, connect to the press release. To see the full set of images taken by the Galileo spacecraft, go to mission images. Jupiter arrival and orbit insertion - July 4, 2016 ... and recently funded through 2021. The Juno spacecraft found a cyclone at the north pole of Jupiter that is sourrounded by eight smaller cyclones. The Juno spacecraft found the clouds in the northern latitudes of Jupiter to be far more interesting than any previous spacecraft had ever seen. The Juno spacecraft found the answer to a 39 year-old mystery as to the lightning of Jupiter first noticed by the Voyager spacecraft. To learn more about this image (a combination of photograph and artistic/science embellishment), click on the link. The Juno spacecraft to this picture of Jupiter clouds, and with some color enhancement, the incredible beauty of Jupiter's clouds is revealed. Click on the link for more information. The Latest Image of Jupiter ... "best ever photograph of the planet from an Earth-based telescope"
Amazing image of Jupiter taken in infrared light on the night of 17 August 2008 with the Multi-Conjugate Adaptive Optics Demonstrator (MAD) prototype instrument mounted on ESO's Very Large Telescope. This false colour photo is the combination of a series of images taken over a time span of about 20 minutes, through three different filters (2, 2.14, and 2.16 microns). The image sharpening obtained is about 90 milli-arcseconds across the whole planetary disc, a real record on similar images taken from the ground. This corresponds to seeing details about 300 km wide on the surface of the giant planet. The great red spot is not visible in this image as it was on the other side of the planet during the observations. The observations were done at infrared wavelengths where absorption due to hydrogen and methane is strong. This explains why the colours are different from how we usually see Jupiter in visible-light. This absorption means that light can be reflected back only from high-altitude hazes, and not from deeper clouds. These hazes lie in the very stable upper part of Jupiter's troposphere, where pressures are between 0.15 and 0.3 bar. Mixing is weak within this stable region, so tiny haze particles can survive for days to years, depending on their size and fall speed. Additionally, near the planet's poles, a higher stratospheric haze (light blue regions) is generated by interactions with particles trapped in Jupiter's intense magnetic field. There is so much to Juipiter, in fact more than an entire high school course could possibly hold, and as time goes by, perhaps more of the interesting Jupiter information from Galileo, can be included in this course. For now though, it is time to move on. Please go to the Saturn page, back to one of the Inner Planets (Mercury, Venus, Earth, or Mars), or return to Introduction to the Gas Giants, or the Planet Introduction, or the Syllabus.